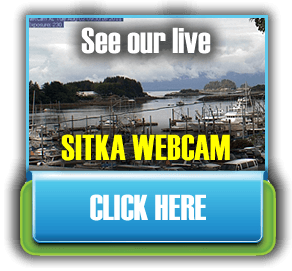 Sitka’s waters are teeming with many species of salmon. You can try hooking them all when you come fishing with Alaska Premier Charters, Inc. and see what World Class Fishing is all about. 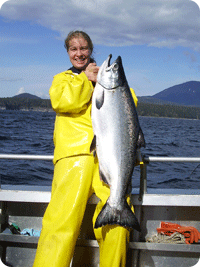 The biggest, most popular and arguably the tastiest species is the Chinook (Oncorhynchus tshawytscha) Salmon. Also known as the King Salmon, it was designated the state fish of Alaska in 1962. They average 22-28 pounds and 30-36 inches long, but it is common to pull in kings that are much, much bigger. The record King Salmon, at 126 pounds, was caught in a fish trap in 1949 near Petersburg. The record sport-caught King Salmon was 97 pounds, caught in the Kenai River in 1986. King salmon can be identified by black irregular spotting on the back, dorsal and tail fins. They have silvery sides and white underbellies and a dark gray, almost black mouth. The best time for trophy-sized king salmon fishing goes from mid-May through mid-August, although they are available both before and after those times as well. View salmon pictures here. Another species of salmon that can be found in abundance in Sitka’s waters are Coho (Oncorhynchus kisutch) Salmon. Also known as silvers, these acrobatic fish average 8-12 pounds and are usually 24-30 inches long. We start seeing a few in late June and they continue to build in numbers, gaining a pound a week. Silvers are very bountiful from mid-July through late August. Numbers start tapering off in mid-September. You can tell Silvers apart from king salmon because they don’t have black spots on the lower lobe of the tail, and they have lighter, gray gums. View salmon pictures here. Besides hooking kings and silvers, you might want to haul in a hefty Chum (Dog), or sporty Pink (Humpback) Salmon. These two species normally populate the rich waters around Sitka from the end of June to the beginning of September. No matter what species of salmon you target, any of them will bend your rod and make your reel sing! We very seldom see Sockeye Salmon caught while sport-fishing with bait. For a chart to help you identify all the salmon species, go to the ADFG website. Not only are salmon fun to catch, but they are also good to eat. Besides being absolutely delicious, they are also healthy for you, with high protein and Omega-3 fatty acids. For our favorite mouth-watering salmon recipes, click here. To learn more about salmon, such as their life cycles and health benefits, go to http://www.sf.adfg.state.ak.us/Region1/sitka_guide/sitkaguide.cfm.